Pardon our dust! This exhibit will be closed for renovations from March 25–April 11, 2019. The McFerrin Fabergé Collection is presented in the state-of-the-art gallery in the Cullen Hall of Gems and Minerals. This gallery is made possible by the generous underwriting of the Artie and Dorothy McFerrin Foundation. The first installation in the gallery is the special exhibition Fabergé: The Art of Presentation. Visitors will experience the design artistry and craftsmanship of the Fabergé workmasters in an intimate setting. Fabergé: The Art of Presentation explores the international politics, diplomacy, economics and innovation in the 19th and early 20th centuries. Beginning with the magnificent crown jewels of Catherine the Great, the development of Peter Carl Fabergé’s techniques and inspiration are explored. 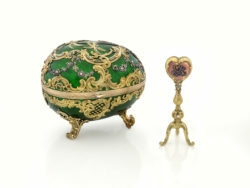 Fabergé: The Art of Presentation is organized by the Houston Museum of Natural Science. It is the premiere exhibition for the Dorothy and Artie McFerrin Gallery in the Cullen Hall of Gems and Minerals. Native Texan and longtime Houstonian, Joel Bartsch was first hired as a security guard at the Houston Museum of Natural Science in 1984, and was appointed President & CEO of the Museum in 2004. His previous years of service at the Museum included his position as Curator of the Cullen….